Bando 250-S5M-850 Go Kart Drive Belt: 1" wide, 34" Length OC, 170 Teeth. Used on Go Karts, Scooters, and outdoor power equipment. 850-S5m-25 Synchronous Kart Drive Belt. **Round, Flat Topped Tooth Design. ** Bando Part no# 250-S5M-850. 1" wide - 34 inch length OC, 170 Teeth, 5mm Pitch. 850-S5m-25 Synchronous Kart Drive Belt. **Round, Flat Topped Tooth Design. ** Bando Part no# 250-S5M-850. 1" Wide, 34" Length OC, 170 Teeth. (Metric: 25mm W x 850mm L) - Designed for Heavy Duty Industrial applications and also used on electric/gas powered Go Karts, Scooters, and outdoor power equipment. Some manufacturers list as 8505M250, 850-S5M-250, S5M850-25, etc. so be sure to check your measurements, tooth shape (profile), and pitch. 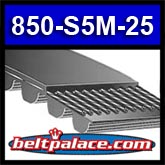 850-5M-25 Synchronous Belt for Go Karts, Power Tools, Industrial Machines and more. Gates PowerGrip HTD Synchronous Belt 850-5M-25.